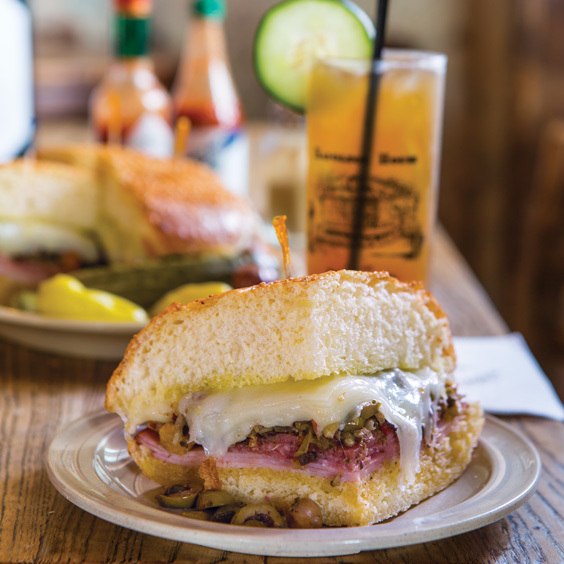 The muffuletta is one of New Orleans’ most iconic and quintessential eats. Traditionally, the colossal sandwich is stacked with Italian cured meats, cheeses, and the signature marinated olive salad, all stuffed inside a round seed–studded loaf. The symphony of flavors coming from the salty meats, creamy cheeses, and tangy olive salad makes for an unbeatable combination, especially as the oil and juices from the olive salad seep into the sturdy loaf. This incredible sandwich—named for the bread it is served on—is said to have been invented in the French Quarter at Central Grocery, a specialty market that was opened in 1906 by Sicilian immigrant Salvatore Lupo. At that time, Italian bakers made round muffuletta loaves that were peddled by street vendors in the French Quarter’s open market. Farmers and fishermen who sold their products in the area would buy the bread from these vendors and purchase fillings—olive salad, cold cuts, and cheese—from nearby Italian groceries for lunch. Salvatore got the idea to sell pre-assembled muffuletta sandwiches to provide his customers with an easy, portable meal. Since its creation, the muffuletta has inspired countless versions throughout Louisiana, and as with any of New Orleans’ traditional dishes, opinions abound on what should go on it, whether it should be served hot or at room temperature, how it should be spelled, and even how it should be pronounced—some say muff-uh-letta, while others say muff-uh-lotta, moof-uh-letta, or moof-uh-lotta. 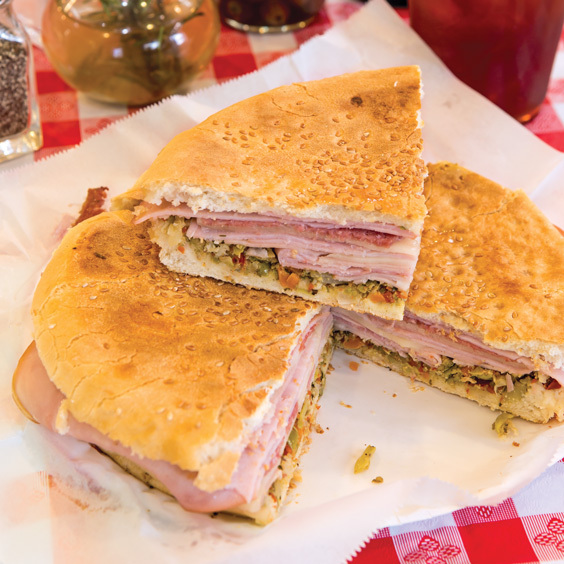 No matter how you slice it, the muffuletta is one of the best culinary creations to come out of New Orleans. Today, the Crescent City is not the only place in Louisiana where you can find one of these superb sandwiches. From the French Quarter to the Capital City and beyond, here are our favorite versions of muffulettas throughout Louisiana. 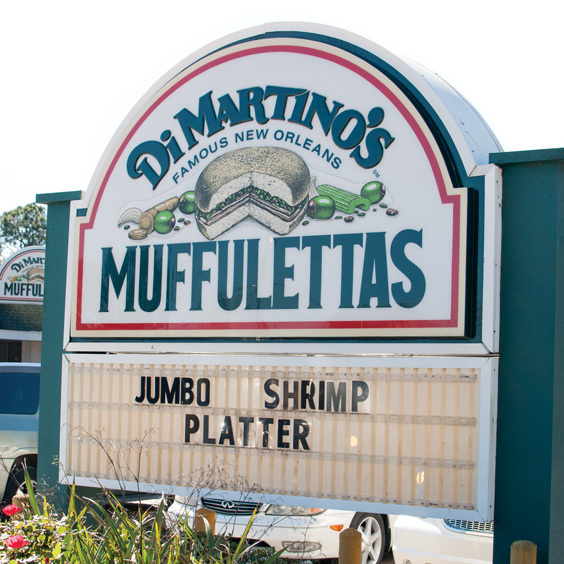 For more than 40 years, DiMartino’s has been turning out muffulettas, po’ boys, and Italian specialties on the Westbank of New Orleans. 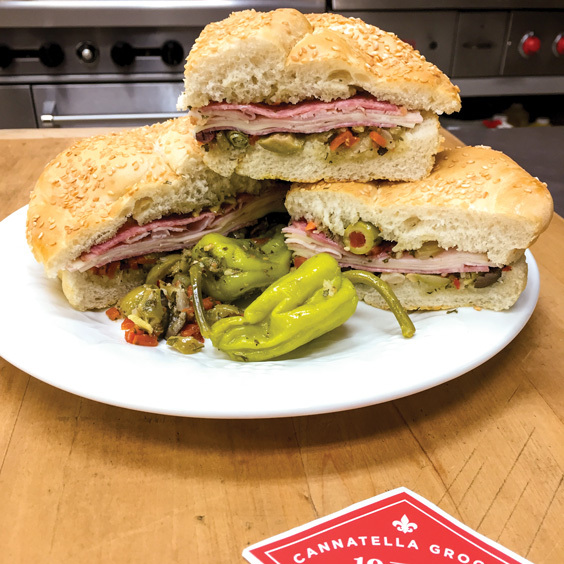 Owner Peter DiMartino, who opened his first location in Terrytown in 1975, fell in love with the muffuletta not only because of how it tastes but also because of the fascinating history behind it. His love for the sandwich is evident in DiMartino’s attention to detail, including sourcing premium ingredients and ensuring that every dish is made to perfection. Ham, soppressatta, mortadella, provolone, and Swiss cheese are precisely weighed to ensure each muffuletta is filled with the perfect mixture of meats and cheeses. The sandwich is run through a toaster oven before being topped with a generous heap of garlicky olive salad. The juxtaposition of cold olive salad against the warm interior and crusty bread creates unbeatable layers of flavor. Now that it has grown to three quick-casual locations and one full-service restaurant, DiMartino’s is fulfilling Peter’s personal mission of bringing classic New Orleans dishes to more people. 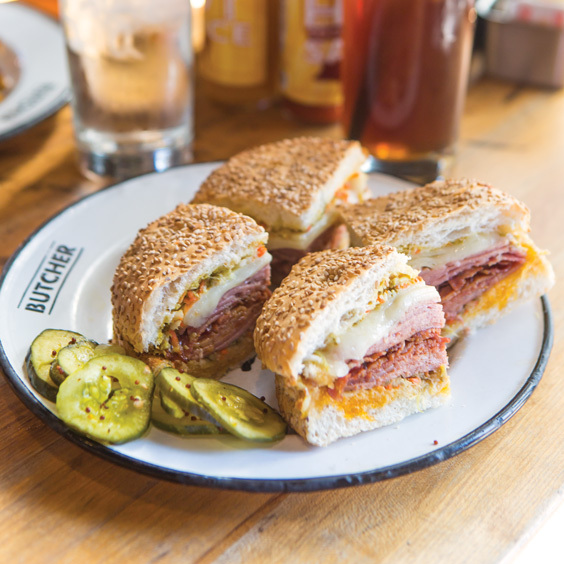 One of the most popular New Orleans muffulettas is served at Cochon Butcher, the artisan sandwich counter and butcher shop offshoot of Cochon restaurant in the Warehouse District. The Cochon Muffuletta is made with the traditional meats found on most muffulettas—salami, ham, and mortadella—but one of the hallmarks of this sandwich is that all of the meats are made in house. “We make our own mortadella and poach it. Our capicola is seasoned and cured for seven days, and we ferment our salami and then dry and hang it for 90 days. All those meats are meat that you can’t get anywhere else,” says Chef-Owner Stephen Stryjewski. A Baton Rouge favorite, Anthony’s Italian Deli has been serving delicious Italian specialties for nearly 40 years. Anthony and Maria Saia opened the deli in 1978 after they moved to Louisiana from Italy. Anthony’s operated on Florida Boulevard for 37 years before moving in 2015 to its new location on Government Street in the Mid City neighborhood. The deli is best known for its muffuletta, which is piled with Italian cold cuts, provolone cheese, finely chopped house-made olive salad, and house dressing on homemade muffuletta bread. Marco, who grew up with the deli and so considers himself a muffuletta connoisseur, believes that Anthony’s Deli stands up to other versions throughout Louisiana. Along the banks of the Atchafalaya River lies the small town of Melville, where Cannatella’s True Value opened in 1923. 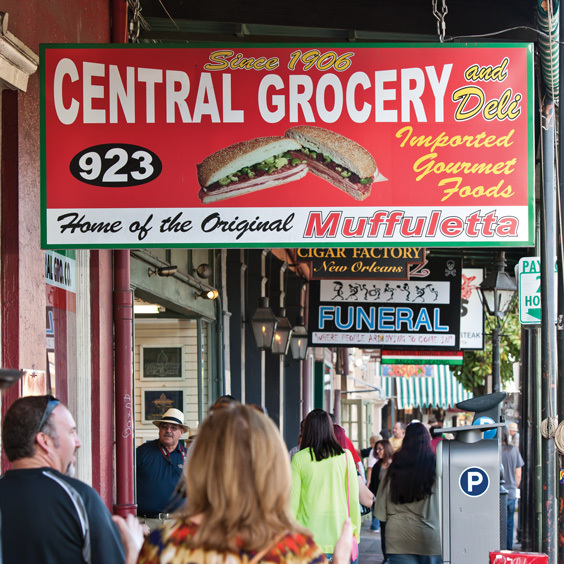 The grocery and general store, which is now the longest-standing business in the area, started selling muffulettas in the early 2000s, when fourth-generation co-owner Grant Cannatella installed a kitchen and developed his own muffuletta recipe in the style of Central Grocery in New Orleans. People come from all over to try the muffuletta, which is served at room temperature (or hot, by request) with the traditional Genoa salami, mortadella, ham, provolone, and Swiss. Both the top and bottom slices of the bread are layered with Grant’s special olive salad, made with green and black olives, giardiniera, freshly squeezed garlic, capers, and herbs. In addition to their incredible muffulettas, Cannatella’s is also known for its house-made Italian sausage, which is made with an original recipe handed down from Grant’s Sicilian ancestors. Nestled in the heart of the historic French Quarter is Napoleon House, a New Orleans institution that has long been a favorite for hot muffulettas and icecold Pimm’s Cups. Joseph “Uncle Joe” Impastato opened a Sicilian grocery at the site in 1914, where he sold sandwiches to dock workers. Along the way, the grocery morphed into a tavern and eventually a restaurant. 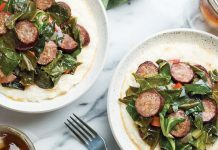 In 2015, local restaurateur Ralph Brennan purchased the restaurant, which continues to delight diners with its classic New Orleans cuisine and welcoming ambience in a nearly 200-year-old building. The muffuletta definitely remains a mainstay of the menu. Chris honors the Impastato family legacy by going back to the original methods of making the restaurant’s classic recipes. That includes making the bread fresh daily, hand mixing the olive salad in Uncle Joe’s bowl, and toasting the bread in a toaster oven, where the edges of the cold cuts crisp and the cheese melts to perfection. 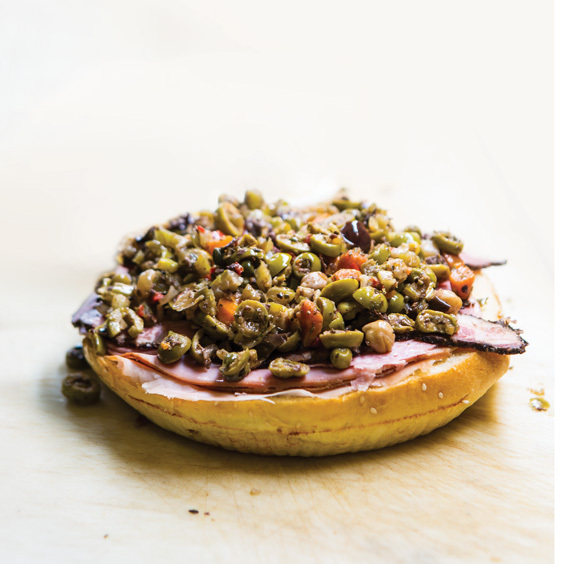 Check out the recipe for the Napoleon House’s crowd-pleasing muffuletta pictured above. “We want to do things as authentically and as originally as possible since it’s such an iconic restaurant,” Chris says. You’ll know you’ve found Central Grocery and Deli when you see a line winding out of the small storefront down the sidewalk of Decatur Street, where the old-fashioned grocery has been located since 1919 after moving from its original location a block away. Not much has changed at the century-old business, which is now run by third-generation family members. The French Quarter fixture is a well-oiled machine, selling anywhere from 300 to 500 muffulettas a day. The store’s quintessential sandwich is stacked with Genoa salami, ham, mortadella, Swiss, provolone, and chunky olive salad. They are made ahead and weighted—a step that causes the oils from the olive salad to seep into the loaf—creating a delightful texture and flavor. Muffulettas are sold by the half and the whole, and can be enjoyed at one of the store’s barstools or to go. 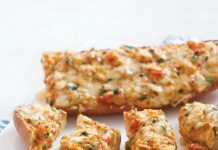 Those who can’t make it to New Orleans for a taste of this culinary masterpiece can enjoy it from the comfort of home, as Central Grocery now ships muffulettas overnight. The oldest family-owned restaurant in Shreveport is also one of the best places to find a muffuletta-style sandwich in north Louisiana. Fertitta’s Delicatessen first opened in 1927 as the Crystal Grocery and transitioned into a deli in 1960, where Sam “PaPa” Fertitta created the now-famous “Muffy,” his take on the muffuletta. “We were the first business in Shreveport to introduce this type of sandwich,” says current owner Agatha Fertitta-McCall. 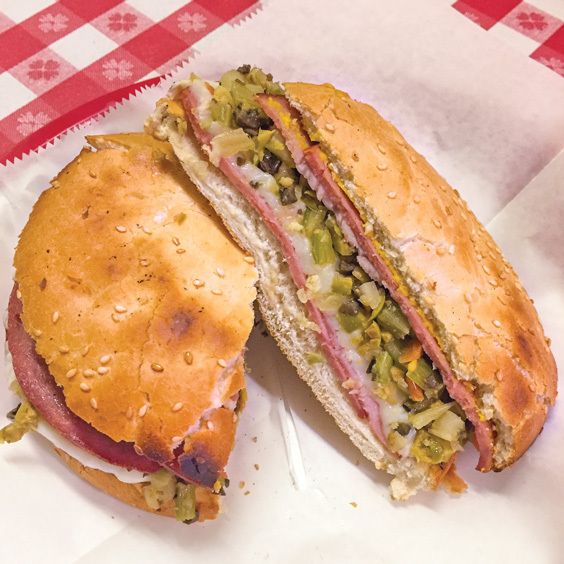 Fertitta’s, which is now on the National Registry of Historic Places, makes the Muffy with muffuletta bread from Joe Gambino’s Bakery in Metairie, but similarities to the traditional muffuletta end there. Instead of Italian cold cuts, Fertitta’s uses cotto salami and Danish spiced ham; rather than provolone and Swiss cheeses, the sandwich has mozzarella. Additionally, the Muffy is topped with PaPa Fertitta’s olive salad mix, which is more finely chopped than that of a traditional muffuletta. The sandwich is slathered with yellow mustard and run through a toaster to heat it before being sliced in half. 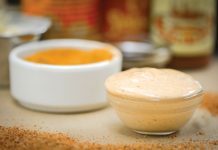 In addition to the Original Muffy, Fertitta’s also offers vegetarian and turkey versions, as well as a menu of other sandwiches, personal pizzas, and salads.